The Agri-Spread AS170-T is a tandem axle 17m³ (600 ft³) spreader capable of carrying 13 ton of fertilizer or 20.4 ton (level) of lime sand. It easily connects directly to any ISOBUS compatible tractor for setup, calibration and rate control. Monitors can be purchased for tractors that are not ISOBUS compatible. The bin sits on load cells and the variable speed floor belt and spinners are driven hydraulically. 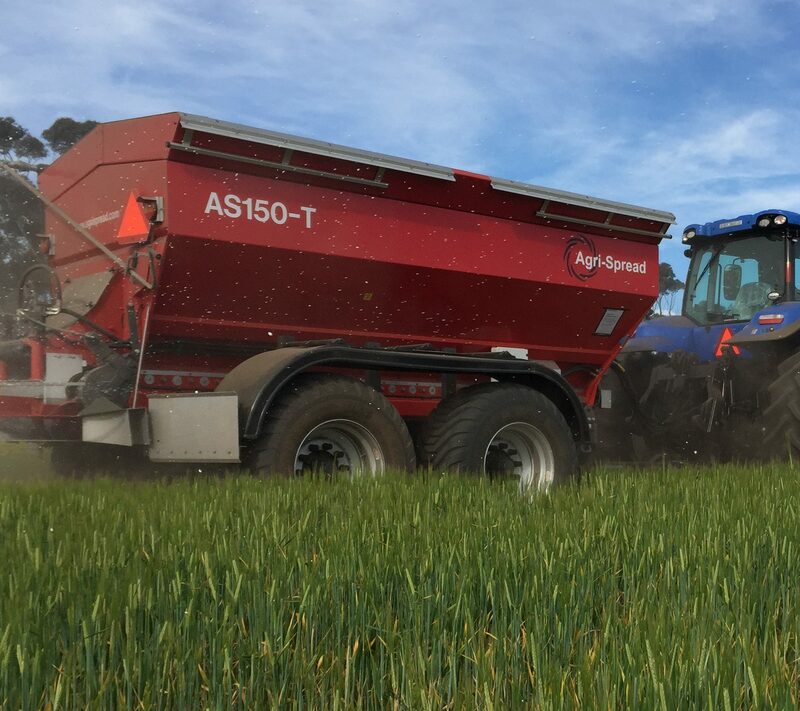 The AS170-T is durable with the bottom third of the bin and rear spreading deck made from stainless steel. All of the fixtures, nuts, bolts and hydraulic fittings are also stainless. ISOBUS compatible, the Apollo II system connects to any ISOBUS compatible tractor. This enables the operator to manage setup, calibration and rate control from the Virtual Terminal Display. VRT compatible. Load Cells give the spreader ultimate accuracy and allow for continuous calibration of product. Flotation Tires give a superior ride and minimise footprint. Available in Trelleborg or BKT tyres . 3m wheel centers enable the spreader to fit with most CTF systems. 36m Fertilizer Discs are easily interchangeable with the Lime, Manure and Gypsum Discs to maximise accuracy for different products. Spreads Urea to 36m – Independently certified and farmer proven. Easily manageable interchangeable disks allow for a quick and simple change between applications. Maximizing accuracy for different products. Spreads Lime & Gypsum up to 16m. Hopper Screen Mesh comes standard and keeps large objects away from belts and spinners to maintain a even and precise spread and not cause any damage. Hydraulic Brakes work with the tractors hydraulic braking system giving you control and safety when under load. The machine can be still operated without this feature. LED Tail lights give indicator safety to the operator and others when transporting or moving machine. Operated from the back of the machine, the sprung roll tarp is designed to provide a weather proof area for product and keeps the hopper clean when not in use. The Calibration kit comes with 13 test trays, 13 test tubes, density scale, kernel hardness tester, grading box and anemometer. These calculate the bulk density, test fertilizer hardness and size for quality & spread characteristics, check wind speed & consistency, measure the accuracy and show adjustments that need to be made to ensure accuracy of spread. The bottom third of the bin, the entire back end as well as all nuts, bolts, belt rollers, rear discharge & hydraulic fittings are manufactured in Stainless Steel. Making the bin high strength and durable as well as corrosion resistant & low maintenance. Agrispread spreaders are shot-blasted and finished with a 2 pack commercial grade paint. UV resistant and provides a long lasting and durable surface finish. Stainless Steel Bin provides a complete rust protection option for your spreader to minimize maintenance and corrosion increasing the life span of the spreader. Fitted to the existing Spreader door, the false door provides for the application of very low rates of products like Mouse Off ® Snail baits and small seeds. Headland Control reduces coverage at paddock edges by reducing outside spinner speed. Minimizes overthrow on first paddock pass and boundaries. Hydraulic Folding Curtains are attached to the rear of the spreader. Completely folding away for transport they increase productivity by allowing low density products to be spread in windy conditions by deflecting the oncoming air over the curtains. Hydraulic Folding Curtains can be retro-fitted.